Thermistor, whose name is derived from a combination of thermal and resistor, is a temperature sensing device that registers changes in internal resistance as a function of temperature. Thermistors are often chosen over thermocouples because they are more accurate, have a shorter response time, and are generally cheaper. For most applications, thermistors are the smart and easy selection for temperature sensing below 300 degrees Celsius [read more about the difference between thermistor and thermocouple here]. In our case, we will be using a Negative Temperature Coefficient (NTC) thermistor, where the resistance decreases as the temperature increases. NTC thermistors are most common in commercial products that operate in the tens of degrees like thermostats, toasters, and even 3-D printers. An NTC 3950 100k thermistor will be used, which is designed for 100kOhm resistance at 25 degrees Celsius. This tutorial will introduce methods for relating resistance to temperature by fitting factory calibration data. The performance of the thermistor will also be evaluated using an Arduino board and a simple Newton’s law of cooling experiment. Zoomed-in photo of an NTC 3950 100k Thermistor. The glass bead design can be seen at the end of the exposed dual wire. Now we see an approxate method for relating T to the resistance, R . The coefficients a, b, c can be found using a least-squares fit against factory calibration data that be acquired from the manufacturer. For my thermistor, I found factory tables that allowed me to fit the data using the equation above [example datasheet with table]. Figure 1: Factory calibration for temperature and resistance relationship for thermistor readings. Now that we have a relationship between the resistance of the thermistor wire and the temperature measured, we need to understand how we can translate resistance into a meaningful quantity that we can measure using an analog-to-digital converter, namely, we need to convert resistance to voltage. And this is explained in the next section. Figure 2: Voltage divider circuit for measuring voltage instead of resistance from the thermistor. The voltage divider equation is incredibly important for relating the thermistor’s resistance, R2 , to the voltage read by the Arduino. But before we read R2, we must first decide which R1 we want to select for the voltage divider circuit. And since we already know V0 = 3.3V, the divider resistor is the last unknown. Figure 3: Voltage divider resistance response curves. The response of the thermistor voltage changes based on the voltage divider resistor chosen. Be sure to select a resistor near the resistor above for your specific desired temperature range. The full implementation of the algorithms and Figures 1 and 3 is implemented below in Python 3.6. Figure 4: Arduino + Thermistor voltage divider circuit. Also take note of the external reference at 3.3V - we choose 3.3V because the voltage divider circuit will likely never reach the higher voltages due to the operating range we are interested in. The 3.3V choice also results in lower noise for the ADC. I have also attached a 10uF capacitor across the 3.3V and GND pins to lower some of the noise as well. The code above averages 10 temperature readings for a more stable output and gives a readout roughly every 500 ms in both Celsius and Fahrenheit. The parameters should be updated for the user-specific thermistor, and the average amount can also be adjusted based on the user’s desired stability. Figure 5: Capacitor smoothing effect on ADC for thermistor reading. In the next section I compare our thermistor to a DHT22 temperature and humidity sensor. As a simple test, I decided to wire up a DHT22 temperature and humidity sensor to see how well the thermistor equation approximate temperature based on its resistance. 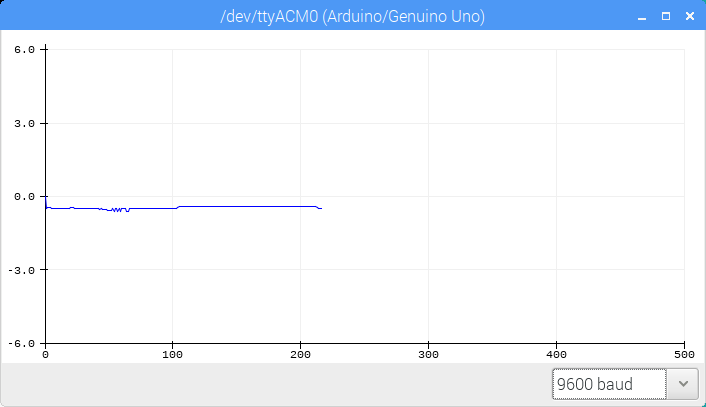 The DHT22 is a classic Arduino sensor, so I expected the two to be fairly close when compared at room temperature. I also wanted to see their respective responses when their surrounding temperatures are increased and watch the response with time to get an idea of how the sensors work over actively changing temperature scenarios. The wiring for the thermistor and DHT22 sensor combination is shown below. Figure 6: Wiring for comparison between DHT22 sensor and thermistor. The Arduino code to accompany the DHT22 and thermistor comparison is also given below. It uses the “SimpleDHT” library which can be installed through the Library Manager. The code above calculates both temperatures and prints them to the serial monitor every 0.5 seconds. It also averages every 10 readings from the thermistor. The code also prints out the difference between the two temperature sensor methods. Below, I have plotted the temperature difference to show the average deviation between thermistor and DHT22. On average and depending on the actual temperature, the difference can span 0.05 C - 1.5 C. And this span is likely due to a few things: the ADC is somewhat noisy on the Arduino, even with a capacitor and 3.3V external voltage reference - not to mention it’s only 10-bit; the thermistor equation also carries some error with it - so for highly accurate readings a temperature-by-temperature interpolation would be the most accurate way to ensure quality results; and lastly, the DHT22 additionally carries 0.5 C error with it, so we can expect errors between them to be as high as 2 C. So, the fact that we’re only seeing 0.5 C difference between them is not bad! In the plot above, it’s easy to see the power of the thermistor and its ability to handle quick-changing scenarios. The DHT22 is only equipped to handle a 0.5s update rate, and in reality can only resolve ambient temperatures, not large bursts of hot or cold. The plot below really illustrates the deficiencies in the DHT22’s ability to handle bursts of temperature changes. Thermistors have temperature responses that are fairly quick, while the DHT22 takes a few readings. The DHT22 also requires some time to recover from a heating period, primarily because of its housing and slow component response. The thermistor is a clear winner when temperature fluctuations are of great importance to measurements. This is why they are often used in experiments where temperatures do fluctuate quickly and accurate measurements are needed. Figure 7: Glass beaded thermistor next to a DHT22 temperature sensor. In this article, I discussed thermistors and how to implement them in Arduino by fitting factory calibrated data to acquire accurate coefficients for finding temperature from resistance. I also discussed how to use a voltage divider to measure voltage as a function of resistance outputted form the thermistor. And lastly, I used a DHT22 temperature sensor to compare the accuracy and advantages of using a thermistor. Thermistors are used in a wide variety of applications because of their accuracy, high responsivity in rapidly changing environments, and their inexpensive and easy-to-use hardware. One of the difficulties with using thermistors is their non-linear repsonse, however with quality calibration and response curves, the non-linear effects can be handled. There are many other experiments that can be done with thermistors to analyze their time responses, lower the non-linear hindrances, and investigate the self-heating effects. This project was meant to introduce thermistors and their theory, while also increasing the understanding of why they are a great choice over other temperature-sensing methods. Thanks to PCBGOGO for PCB prototyping help and for sponsoring me in this project. If you enjoyed the experiment, please share the project and go to pcbgogo.com to purchase a custom PCB board for your own electronics projects.